Although never a supreme athlete, I have always stayed active and competitive, mostly through team sports—baseball, basketball, football, etc. But with age, responsibility and a full calendar, it has become harder to be involved with any group athletics. Nowadays, I take brisk walks or jog, usually in the morning, which is my time to ponder the day ahead. I often follow those trips around the block with push-ups or sit-ups and other calisthenics to maintain strength and flexibility. Early this year, though, I rediscovered a sport that currently has my attention—one that combines individual focus and team orientation and draws on my competitive nature: Brazilian Jiu-Jitsu (BJJ). In the 1990s, BJJ was made more prominent outside of Brazil by renowned expert Royce Gracie, of the famed Gracie family, which is credited with founding this particular style of fighting. Royce took the MMA world by storm, winning three of the first four Ultimate Fighting Championships. All told, I have spent almost a year in Brazil, most of which was in Sao Paulo. It was in “Sampa,” as the megalopolis is routinely called by its habitants, that I first discovered BJJ. With a friend who lived nearby, I dropped into a class one night and was immediately captivated by its natural flow. Despite the initial attraction, I never made it back to another class while in Brazil. Fast forward five years to 2009. 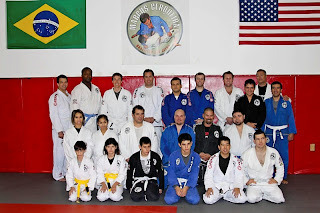 While driving through the Houston Heights, one of the city’s historic neighborhoods close to Cherryhurst, I came upon the Brazilian Arts Foundation, and within it, The Heights Jiu-Jitsu Club. I recognized this club as an opportunity to conveniently acquire a new skill, all while reconnecting with the rich culture and heritage of Brazil. His open attitude was the only impetus I needed. I stopped by the Brazilian Arts Foundation one night during the following week to check out my first BJJ class in Houston. I was hooked from that point, ordering an Atama Gi a few days later. Marcos subtly continues to push BJJ to the top of my priority list, hinting that noticeable improvement comes with increased commitment, a truth I cannot disclaim. Last weekend, we had our annual belt ceremony at BreakAway Speed, a training facility for Houston area athletes and where Marcos also trains students. To my surprise, I was awarded a stripe on my belt, an incremental sign of progress before graduating from one belt color to the next—hardly an accomplishment for some, but fun for me nonetheless. 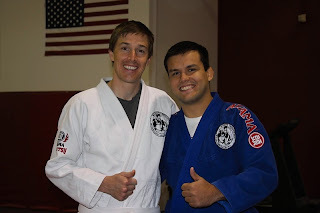 Life has generally improved for me since making the choice to try BJJ, so for that alone, I take a moment to thank Marcos for encouraging me to keep at it. By no stretch am I the most dedicated person who trains under Marcos, nor are my goals as lofty as those of many of his other students. I try to attend two classes a week. I have not fought in a tournament yet, and frankly, am not sure that I ever will. Be that as it may, I have still learned a lot from practicing BJJ over the last several months. There is certain respect for the opponent and self-control in BJJ that I appreciate. I enjoy the camaraderie shared among team members. I like the mental aspect to BJJ, which can be equated to a game of chess, one person reacting to the every move of another. There are untold parallels between Brazilian Jiu-Jitsu and life off the mat. This verse rings as true in life as it does in training BJJ. While our lives are not full of joint-locks and chokeholds, we inherently face difficult situations. Just like in BJJ, the strategy in life is to overcome the challenges we face, growing stronger all the time by learning from others. Great read... enjoyed the tapping out reference. Remembering the inspiration of your blog will keep me from tapping out on Floor 12. The No. 1 choice for top awesome top awesome BJJ Gi, Jiu Jitsu Gi, BJJ Kimonos. Jiu Jitsu Kimonos,Jiu Jitsu Gi and BJJ Gadgets.